The Samsung Galaxy S III might not yet have arrived on the two biggest US carriers Verizon Wireless and AT&T, but Sprint and T-Mobile already have the SGS III. If you want the best deal on the hottest Android phone so far, though, you’d need to get it elsewhere as RadioShack and other retailers have slashed the price to make the device even lighter on your pocket. At RadioShack, a new Galaxy S III with a two-year contract on Sprint will cost you only $149.99, which is $50 less than the price you’d pay at the carrier. Currently, the Pebble Blue 16GB version is sold at that price. Best of all, you get free next day shipping and $10 Google Wallet credit. Amazon Wireless and Wirefly are also offering good deals by dropping the price to $179.99. And while Amazon’d deal might not sound as good as the one at RadioShack, Wirefly adds a free 16GB microSD card to the package making it an even better value. On Amazon, the SGS III is backordered though. 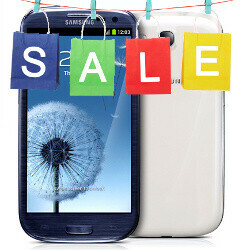 Off contract, the Galaxy S III costs a hefty $589. Are you getting it on Sprint or waiting a couple more days for the phone to hit Verizon and AT&T? Wow. Misspelling in the title. That's a terrible offense. lol as Charlie Sheen would say... "Winning"
Is there a new carrier in the US name spint?! lol!! This is complete crap. Retailers shouldn't even have the privilege to sell phones that are just launching. Hurting the paychecks of those employees that work at the actual wireless stores that rely entirely on phone sales and are completely dedicated to it. Death to Radio Shack, Walmart, BestBuy and all others! Includes free screwed up account. Be sure to buy their "insurance", too. Indeed. Radioshack is the worst. Trust me, Radioshack is the most consistent with messing up the customer's account in some way. You're better off at the corporate store, best buy, walmart, not sams club (also ran by radio shack for their mobile phone sales), amazon, wirefly, basically everything else.